Are you a neophyte or a beginner at HTRF? Maybe you are looking for an overview of this technique rather than a deep dive into its technical details? Then this short video is for you! FRET was first theorized and investigated by Theodor Förster in 1946. It was only in the 1970s that it was exploited in biologic and diagnostic systems. It is based on the transfer of energy between two fluorophores, a donor and an acceptor, when in close proximity. Molecular interactions between biomolecules can be assessed by coupling each partner with a fluorescent label and by detecting the level of energy transfer. Of course, FRET is governed by the physics of molecular proximity, which only allows this phenomenon to occur when the distance between the donor and the acceptor is short enough. In practice, FRET systems are characterized by the Förster’s radius (R0) distance at which FRET efficiency is 50%. The radius is highly dependant on the nature of fluorphores and partners. These fluorophores can be coupled to interacting partners so that when the partners come close enough to each other, the dyes are mechanically brought into close proximity too (Angströms). Excitation of the donor by an energy source (e.g. a flash lamp or a laser) triggers an energy transfer towards the acceptor, which in turn emits specific fluorescence at a given wavelength (Fig. 1). The donor and acceptor can be grafted covalently onto multiple partners that can associate, among others, two dimerizing proteins, two DNA strands, an antigen and an antibody, or a ligand and its receptor. Figure 1: The detection of specific fluorescence is a sign that a FRET process has taken place, due to the proximity of the two interacting partners. Because of these spectral properties, FRET, a donor-acceptor complex, can be detected without the need for physical separation from the unbound partners. Fully homogeneous assays do not require separation steps such as centrifuging, washing, filtration, or magnetic partitioning. Traditional FRET chemistries are hampered by background fluorescence from sample components such as buffers, proteins, chemical compounds and cell lysate. This type of background fluorescence is extremely transient (with a lifetime in the nanosecond range) and can therefore be eliminated using time-resolved methodologies. HTRF is a FRET-based technology that emerged from the Jean-Marie Lehn’s Nobel prize-winning work on rare earth complexes. Due to the chemical and photophysical characteristics of these fluorescent dyes, HTRF exhibits performance levels in stability and specificity that make it unparalleled for time-resolved FRET studies. It is especially extremely stable in time, allowing repetitive measurements for days. The very structure of HTRF reagents also makes assays highly resistant to most experimental conditions, including additives, chelates, DMSO, ionic strength, challenging cations, pH, temperature, or cell culture media. See the reagent chemistry tab for more details about HTRF reagents. Most information displayed in this Technology Section can be found in our two dedicated documents. 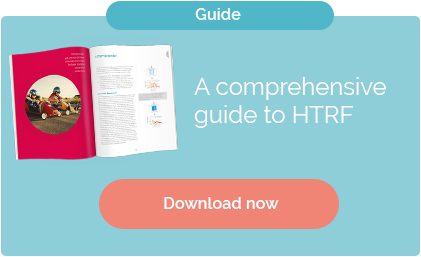 Our Guide covers the theoretical aspects of HTRF and features additional experiments and data, while the Application Note gathers information relative to the methodological aspects of HTRF assays. HTRF combines standard FRET technology with time-resolved measurement of fluorescence, eliminating short-lived background fluorescence. As shown in Fig. 1, introducing a time delay of approximately 50 to 150 µ seconds between the system excitation and fluorescence measurement allows the signal to be cleared of all non-specific short-lived emissions. In contrast, HTRF acceptors emit long-lived fluorescence when engaged in a FRET process. Therefore, long-lived emissions signify energy transfer due to the proximity of the labeled biomolecules. Figure 1: The energy pulse from the excitation source (flash lamp, laser) is immediately followed by a time delay, allowing interfering short-lived fluorescence (compounds, proteins, medium…) to decay. Improved ease of use and sensitivity compared to ELISA and Western Blot. HTRF assays are homogeneous, and as such they do not require a wash step. They can be basically performed with a streamlined add-and-read protocol. These assets make the HTRF approach more convenient and less time-consuming than other detection methods such as ELISA or Western Blot. When compared to Western Blot, HTRF assays exhibit a considerable time-saving opportunity and a far better reproducibility, enabling the detection of subtle variations in target quantity which a Western Blot approach could not address. In this experiment whose results are showcased in Fig. 2, both the Western Blot and phospho-ERK assays were used to investigate the effect of erlotinib on ERK1/2 in Human BxPC3 pancreatic tumor cells. The experiment took 24h with the Western Blot and 4h with HTRF. As shown, the Western Blot approach lacks reproducibility and would ultimately result in misinterpretating the effects of the molecule tested (erlotinib). In contrast, the HTRF assay was not only 6 times faster to perform but also proved to be highly reproducible, enabling a clear identification of the phospho-ERK1/2 inhibition by erlotinib, which is corroborated by the related literature (E. Buck et al., 2006; Diep CH et al, 2011). Figure 2: Side-by-side analysis of phospho-ERK1/2 (Thr202/Tyr204) in tumor lysates using Western blot and HTRF (two independent analyses a. & b.). Error bars represent standard deviations. HTRF Förster’s radius (R0) lies between 50 and 90 Å, depending on the acceptor used. However this distance is theoretical, as it does not take into account spatial molecular rearrangements. In practice, a wide variety of HTRF assays involving molecular complexes of different sizes have been implemented. They include assessment of small phosphorylated peptides, immunoassays for quantifying large glycoproteins such as thyroglobulin (Fig. 3.A), and indirect detection (via secondary antibodies) of tagged complexes such as CD28/CD86 (Fig. 3.B), and therefore a broad range of possible molecular distances. Figure 3: Two HTRF assays theoretically involving very different donor-acceptor distances. Detecting a phosphorylated biotinylated-peptide (short distance), and CD28/CD86 association quantified by anti-tag conjugates (long distance). GST-tagged b-Catenin and 6HIS-TCF4 interaction was detected using anti-GST Eu cryptate-tagged and anti-HIS d2-tagged antibodies. The assay was then used to characterize two inhibitors of the interaction under study: the corresponding dose-response curves and their associated IC50 values are presented in Fig. 4. The resulting IC50 were found to agree with published values, which demonstrates that the large size of the complex does not prevent FRET from occuring and demonstrates HTRF’s ability to address interacting partners that would theoretically exceed Förster’s radius in size. Figure 4: Inhibitors characterization in the HTRF TCF4:β-catenin assay. Fig. 5 shows a dose-response curve of the unlabeled H4 Kac(5,8,12,16) peptide measured with HTRF assay. The Ki value of 2 µM obtained agrees with the published affinity of 2.8 µM for BRD4:H4 interaction (18) and demonstrates HTRF’s relevance for studying low affinity interactions. Fig. 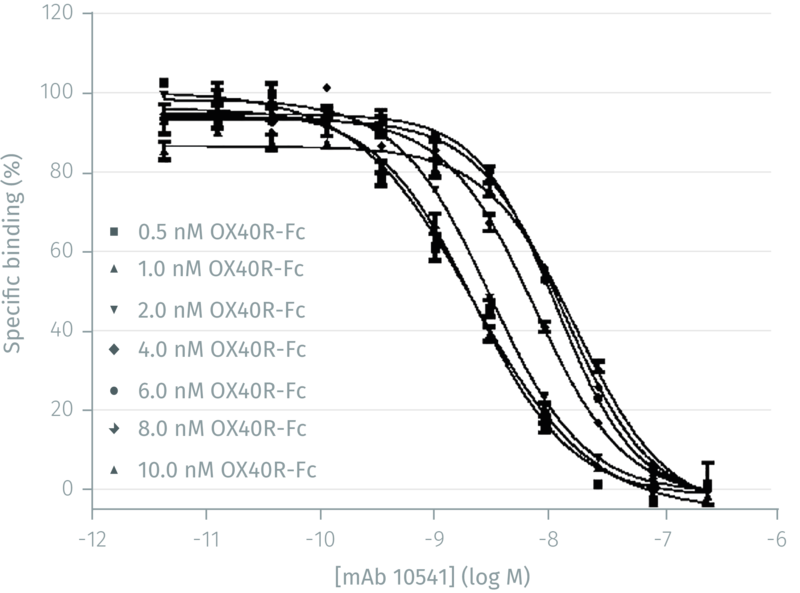 6 features IC50 plots showing how increasing concentrations of OX40R-Fc (0.5-10 nM) compete with OX40L-FLAG (0.5 nM) to bind with OX40-Receptor. The resulting IC50 plots show an expected rightward shift as the concentration of soluble OX40R-Fc increases, which indicates that HTRF provides the expected outcome when addressing high affinity interactions. The usual limitations of FRET principle applications lie in two main characteristics: signal specificity and stability. Because of the nature of its fluorescent partners, HTRF performs outstandingly in both, making it better at exploiting the FRET principle than any other approach. HTRF involves several carefully selected fluorophores. Obviously, FRET partners must fulfill multiple compatibility criteria. First, their emission spectra must show non-overlapping regions in order to be able to measure each partner’s fluorescence individually. Second, the FRET quantum yield (i.e. its efficacy) must be as high as possible. Third, fluorescence emission must occur within a region of the spectrum remote from that naturally produced by proteins; in other words, a red-shifted emission is theoretically better in order to avoid medium-intrinsic fluorescence. To match all these criteria, HTRF uses a combination of several fluorophores forming different TR-FRET systems. HTRF’s central element, the energy donor, consists of a rare earth complex in which the lanthanide ion (Europium or Terbium) is tightly embedded in a macrocycle. This very unique type of structure gives HTRF donors their long-lived fluorescence properties, as well a robustness that enables these molecules to be used in most assay conditions. These macrocyclic structures allow both the collection and transfer of energy to the Eu3+ or the Tb3+ ions, which ultimately release this energy in a specific fluorescent pattern (Fig. 1). Both cryptates show long-lived emission in the range of 1 to 2 msec, a characteristic that is fundamental for a time-resolved detection. Europium cryptates (Eu3+cryptate) is the fruit of Prof. J.M. Lehn’s work, for which he was awarded a Nobel Prize for Chemistry in 1987, are a series of rare earth complexes whose macrocycle is based on an lanthanide embedded in a tris-bipyridine motif. Lumi4®-Tb cryptate was developed by Prof. K. Raymond’s group at Berkeley, and consists of a tight association of a terbium ion with a cage of similar structure and properties. The other fluorescent partners of HTRF are the acceptors. They have been carefully optimized to pair with Eu3+ and Tb3+ cryptate donors and ensure maximum FRET signal. In particular, acceptors have been developed to match the emission properties of donors. As shown in Fig. 1, Eu3+ cryptates are mainly compatible with near infrared acceptors, whereas Lumi4-Tb cryptates can be paired to both red and green ones like fluorescein or GFP. The first acceptor developed for HTRF was XL665, a phycobilliprotein pigment purified from red algae (cyanobacteria phycobilisomes). The second generation of acceptors is characterized by synthetic structures 100 times smaller, displaying a series of very close photophysical properties. XL665 is a large hetero hexameric edifice of 105 kDa, cross-linked after isolation for better stability and preservation of its photophysical properties in HTRF assays. d2 and Green dye excitation spectra overlap those of both Eu3+ and Lumi4-Tb cryptate emissions, thereby allowing the donor to excite its acceptor, whose maximum emission at 665 nm (d2) or 520 nm (Green) spans a region where HTRF cryptates do not emit or do so only weakly. In the end, energy transfer with the donor occurs with a high quantum yield. The d2 acceptor, an organic motif of approximately 1,000 Da, is highly compatible with Eu3+ cryptate. The comparison of d2 to XL665 was achieved by screening 14,700 compounds on an assay for quantifying a phosphorylated peptide. As shown in Fig. 3, the correlation between the two systems was extremely close, and validated the integration of d2 in a number of different HTRF assays, notably cAMP and IP-One. As it is a much smaller entity, d2 limits the steric hindrance problems sometimes suspected in XL665-based systems. Evaluation also showed that the new acceptor contributed to significantly greater stability of immuno-competitive assays, and in some cases to better assay sensitivity. The combination of Lumi4-Terbium cryptate to green acceptor dyes or fluorescent protein broadens HTRF field of applications. In addition to XL665 and d2, green acceptors are fully compatible with the spectral characteristics of Lumi4-Tb cryptate. These properties have led to the development of Tag-lite® ligand binding assays in which the second partner, either a ligand or a second receptor respectively, is labeled with a green synthetic acceptor. The use of encoded fluorophores such as GFP was also demonstrated, opening the possibility for cell-based assays with GFP fusion proteins as one of the assay partners. HTRF reagents are optimized to match each other’s photophysical properties (Fig. 4). Red acceptor emissions occur in a region where the donor does not emit significantly. Long-lived fluorescence detected at this specific wavelength is therefore characteristic of the emission of the acceptor engaged in the FRET process. The same is true for green acceptors emitting around 520 nm when combined with a Lumi4-Tb donor. Figure 4: HTRF donor and acceptor emission spectra. HTRF can also be used with high serum concentrations (up to 50%), as exemplified by its application for clinical diagnostics (TRACE® technology with KRYPTOR® workstation). For Europium cryptate based assays, addition of fluoride ions at the time of readout or during the incubation enhances assay resistance to the great majority of compound interferences (e.g. quenchers). Fluoride ion supplementation is not mandatory for Lumi4®-Tb based assays. Figure 5 shows the rapid dissociation of chelates in presence of EDTA, while cryptates remain unaffected at first, then exhibit a slow dissociation and loss of fluorescence due to their macrocycle embedded ion. Figure 5: Europium and Terbium cryptates and competitors’ chelates (Lance Europium, Perkin Elmer), Lanthascreen Terbium (ThermoFisher), ADAPTA Europium (BellBrook Labs) were conditioned in buffer + EDTA (20 mM), i.e. typically the kind of assay conditions that are used to stop an enzymatic reaction. Europium cryptate was incubated in various media used for cell cultures and compared to non-supplemented buffer (Fig. 6). The results show that the effect is marginal (within less than 20% variation), proving that cryptates are particularly well-suited to cell-based assays. HTRF reagents are especially resistant to culture media with FCS, BSA, DMSO or detergents. A number of homogeneous technologies (e.g. luminescence) are restricted by a reduction in signal intensity following assay measurement or prolonged incubations. Long signal stability is among the many benefits of HTRF technology. HTRF fluorescence is not dampened by assay measurement, assay additives such as DMSO, or extended incubations prior to reading. The advantages of the tremendous stability of HTRF fluorescence include read time flexibility during HTS measurements, the ability to perform kinetic studies, and increased sample compatibility. As an example, the cAMP IC50s, as shown on Figure 7, remained stable over a period of 7 days. Time flexibility and assay security! In case of instrument failure, it is possible to read the microplates even after an extended period of time. Assays can be measured as frequently as desired (Fig. 8), opening up the opportunity for kinetic measurement of interactions for many assay configurations and for flexible assay formats. Photobleaching – a phenomenon affecting many fluorophores – is the disappearance of fluorescence emission after prolonged or repeated excitation. The fluorophore reaches permanent excitation state without any deactivation (i.e. fluorescence emission). Not only are HTRF reagents not impaired by repetitive exposure to light, but they are also resistant to photobleaching and retain their ability to deactivate even after intense excitation. Tag-lite is a non-radioactive, cell-based technology that enables the investigation of natural ligands, small molecules or antibodies binding to cell surface receptors. It is especially advantageous for GPCR and RTK investigations, for biotherapeutic antibody development, as well as for the study of ligand kinetics. This technology combines HTRF with SNAP-tag®, CLIP-tag® and HaloTag® technologies. It offers an alternative to existing cellular bioluminescence resonance energy transfer (BRET) and FRET assays, and providing a new targeted way to label your protein of interest. All three of these protein fusion tags form covalent bonds with specific chemical substrates and can be attached to N- or the C-terminal position on proteins of interest through a simple enzymatic reaction. SNAP-tag and CLIP-tag, are small fusion tags from NEB technology that interact covalently with dyes conjugated to guanine or chloropyrimidine leaving groups via a benzyl linker. How does it work? A cell surface receptor case study. 1. Construction of a plasmid encoding the cell surface protein of interest fused to a SNAP-tag, CLIP-tag or HaloTag. We also have has an extensive collection of pre-cloned expression constructs for tagged GPCRs and RTKs, and Cisbio can develop custom ones. 2. Transfection of cells and expression of the tagged cell surface protein. Tag-lite is compatible with transiently or stably transfected cells. Cisbio offers a variety of stable cell lines and ready-to-use frozen cells which express specific tagged-GPCRs. 3. Labeling of tagged cell surface protein using tag-specific substrates conjugated to an HTRF fluorophore. Cisbio offers SNAP-tag, CLIP-tag and HaloTag specific substrates labeled with Lumi4®-Terbium, green or red acceptor fluorophores. 4. Labeling of the binding partner of interest with the corresponding HTRF fluorophore. Tag-lite has been used for peptidic, non-peptidic and complex ligand binding as well as antibody binding. Cisbio offers a range of HTRF-labeled ligands for immediate use, and provides custom labeling of ligands as part of its service offering. 5. Conducting biomolecular binding assays. Incubation of labeled cells or cell membrane preparations with binding partners – antibodies, compounds – followed by HTRF measurement. SNAP-tag, CLIP-tag or Halo-tag, is covalently linked to an HTRF fluorophore (donor or acceptor) thanks to a tag-specific substrate (Fig. 2) composed of the HTRF fluorophore combined to a tag-specific linker. These substrates are not cell membrane permeable and are chemically inert towards other proteins, which prevents any non-specific labeling of other cell surface proteins. The enzymes performing the labelling reaction are suicide enzymes. They metabolize their substrate and transfer part of this dye-coupled substrate to themselves while attaching the dye to the protein of interest. The process is irreversible and inactivates the enzyme. While Kd or Ki refer to the equilibrium constant, and thus reflect an equilibrium state; Koff and Kon constants allow the prediction not only of the equilibrium state of a drug, but also of how fast the drug-receptor system responds to changes in the concentration of the drug or to another competitor. Thanks to its flexibility and features, Tag-lite enables the fast and easy calculation of these Kon and Koff constants. First, the dissociation rate (Koff) was determined with a dissociation experiment. The receptor and different concentrations of ligand were allowed to bind until equilibrium, before dissociation with a competitor (Fig. 3). The Kd was then determined by saturation binding assays where different ligand concentrations were tested until the system reached equilibrium (Fig. 4). Finally, an observed association rate (Kobs) was obtained through association experiments that measured the proportion of associated receptors over time depending on the ligand concentration (Fig. 5), then processed into Kon using an equation linking Kobs, Koff, and Kon. The results presented in table 1 correlate well with those for unconjugated spiperone, as measured by S. Kapur and P. Seeman using radioactivity (Antipsychotic agents differ in how fast they come off the dopamine D2 receptors. Implications for atypical antipsychotic action, J Psychiatry Neurosci 2000;25(2):161- 6). Even when tagged and expressed at the cell surace, receptors stay fully functional, as exemplified in the vasopressin case study. Reverse transfection of vasopressin 1a receptor was performed with the wild type (WT-V1a) and the SNAP-tag V1a (ST-V1a) of the receptor. Inositol 1-phosphate production induced by vasopressin stimulation was assessed using the IP-One kit on the two different cellular models (Fig. 6). Vasopressin EC50s measured with IP1 accumulation assay were very similar on both WT-V1a and ST-V1a confirming that SNAP-tag fusion on the GPCR N-terminal and its specific labeling with the appropriate fluorescent substrate do not affect either the GPCR binding of a specific ligand or the GPCR function. Tag-lite assays retain all the advantages of HTRF assays. They are homogeneous in nature and measured via dual wavelength donor and acceptor emission readouts. If the HTRF-labeled cell surface protein and binding partner interact, FRET occurs and HTRF emissions are produced at both the donor and acceptor wavelengths. In the absence of binding, only HTRF donor emissions are produced. Just like in HTRF assays, the donor and acceptor’s wavelengths of emission are matched to ensure the signal specificity (Fig. 7). The dual detection of the donor and acceptor fluorescence confers an unparallel precision to the results obtained. Homogeneous fluorescence assays are by nature compatible with extensive miniaturization. As opposed to radioactivity or luminescence for instance, fluorescence intensity depends on concentration, not on ponderal quantities of tracer. This property allows HTRF assays to be easily miniaturized while maintaining their accuracy and reproducibility. These characteristics, combined with lower compound and reagent requirements, enable more cost-effective screens and assays, and make HTRF a truly HTS and robotics friendly technology platform. The fluorescent signal is directly dependent on concentration. Reagents should not be diluted. Instead, simply decrease the volumes used per assay. The example given here illustrates a miniaturization from 200 to 20 µL. Reagent concentration may be required for a maximum assay performance of ultra-miniaturized assays (lower than 5 µL). Miniaturized assays mean that the plate reader setup has to be properly configured. As shown hereafter, the excitation beam needs to be focused accurately into the well (case A). In case B, where the same plate format is being used with a smaller volume, unfocused excitation will lead to a poorer collection of emitted light. The use of a plate designed for small assay volumes, such as in case C, will restore the measurement efficacy. 5 mL of cells (800 cells) were stimulated for 24h with 1 mL of compound, then supplemented with 4 mL of HTRF reagents and incubated for 1h at room temperature. One hundred and twenty different 384w and 1536w microplates were run for Z’ factor (Fig. 1) and IC50. IC50 were then compiled into IC50 correlations between 384w and 1536w formats (Fig. 2). Z’ factor, as originally described by Zhang et al. (J Biomol Screen. 1999;4:67–73), is now a well-established statistical criteria used to assess the overall robustness of an assay for screening campaigns. It is particularly useful for evaluating the impact of miniaturization. Because they are homogeneous by nature, HTRF assays show better accuracy than other formats (e.g. bead-based or heterogeneous). They give high Z’-factors in most configurations, even at low signal-to-background. The ratiometric correction and the excellent stability of the chemistry also contribute greatly to this robustness. The linearity of the IC50 correlation further assesses the quality of the miniaturization and the robustness of the assays when decreased in size. 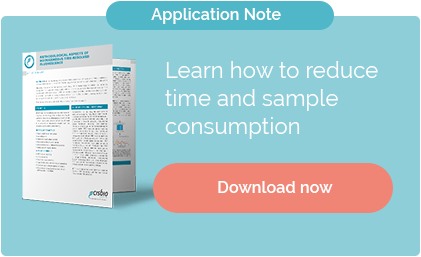 Highly stable reagents provide significant benefits in a screening setting by allowing large batch preparation, in turn avoiding assay variability, reducing costly dead volumes, and eliminating daily preparation time. In this experiment, standard curves were run with conjugates stored at different temperatures (room temperature, 4°C and frozen) for 24h, 48h and 96h to assess the stability of HTRF reagents over time depending on storage conditions (Fig. 3). Results show that HTRF reagents are highly stable at 4°C or room temperature for up to 96h, providing great freedom in the preparation and storage of conjugates prior to HTS campaigns. When implementing an HTRF assay on an HTS platform, critical additional time and throughput can be gained by premixing HTRF reagents. This allows the process to save a dispensing step while not sacrificing the efficiency of the assay. In this experiment, two standard curves were run, one using pre-mixed reagents dispensed in a single step, the other using two successive steps (one for each reagent). (Fig. 4). Standard curves show that running the assay with premixed or separate conjugates results in essentially identical standard curves. Premixing conjugates streamlines the assay process without compromising results.